The No. 3 University of Florida gymnastics team (1-0) opened the 2009 season with a 196.50-195.075 dual meet win versus No. 10 Oklahoma (0-1) Friday evening in front of a Stephen C. O’Connell Center crowd of 4,856. It is the nation’s top total posted in this very young season and the total was the fourth-highest opening total in school history. Florida’s top event total of the evening (49.25) came on the balance beam. The event title was claimed by Castillo, whose stellar performance was punctuated by her stuck double-back dismount. 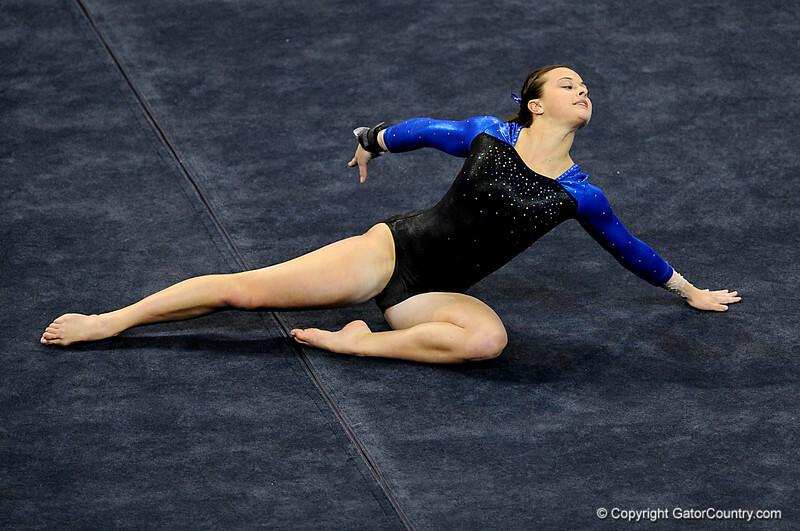 She was rewarded with a 9.90, just a fraction off her collegiate beam best of 9.925. It was the sixth beam title of her Gator career. The floor exercise title was shared by a pair of Gators at 9.90. For Hartung, it was her 17th floor title as a Gator, while it was the first floor win for junior Maranda Smith. The mark was a collegiate best for Smith. Junior Rebekah Zaiser also matched her collegiate best on floor Friday, sharing third overall at 9.825 with Oklahoma’s Kristin Smith and Ashley Jackson. Florida’s four freshmen all appeared in Friday’s meet, either as part of the competitive lineup or as an exhibition performer. Freshman Amy Ferguson opened her Florida career with a mark of 9.75 on floor and received the meet’s Ernestine Weaver Award for the most entertaining routine. But it was the experience of competing in front of the Gator fans that she will remember most. (Casey Brooke Lawson / Gator Country) Freshman Elizabeth Mahlich competes on floor during the Gators victory over the Oklahoma Sooners in Gainesville, Fla., on January 9, 2009.